Have you ever tried to decipher the label on a cone of thread? Finding the name, color and fiber type is fairly straight forward but many times there are other numbers on the thread that might be a mystery to you. In this article we are going to take a close look at what those extra numbers mean on a thread’s label. This is the second in a series of articles. Our first article was all about thread fiber types. As a quilter, choosing your thread is just as important as the choice an artist makes when picking up a brush for their canvas. If the artist chooses a big brush then the resulting strokes will be bold and speak much louder than the small bristle stroke from a tiny brush. In quilting, the thickness of the thread will change how your quilt reads to the eye. A thick thread will pull the eye to it- as will a bright color or shiny finish. When doing dense quilting you may want to choose a super skinny thread so the density of the thread’s path melts into the fibers of the quilt’s fabric. Picking your thread is so much more than choosing a color! On your thread’s label you’ll typically find two numbers. One number refers to the weight of the thread and the other number refers to the ply. We will talk about weight of the thread first. Every thread company has a preferred method of referring to the thickness of their threads. Some use the word “weight” and others use “Tex”. Technically a thread that uses a “Tex” notation on their label is referring to the weight in grams of a thousand meters of thread. Don’t get too hung up on the weight or Tex number. You will find it won’t be consistent between different manufactures because it is up to each thread maker to determine what weight they will use to describe their thread. Instead, use your eyes and your hands to see if you like the diameter of the thread for your particular project. Know that the weight listed on the thread’s label are not a scientific denotation of some kind and there is no governmental agency dictating what a 40 weight thread is, so each manufacturer has their own definition. There is no standard. 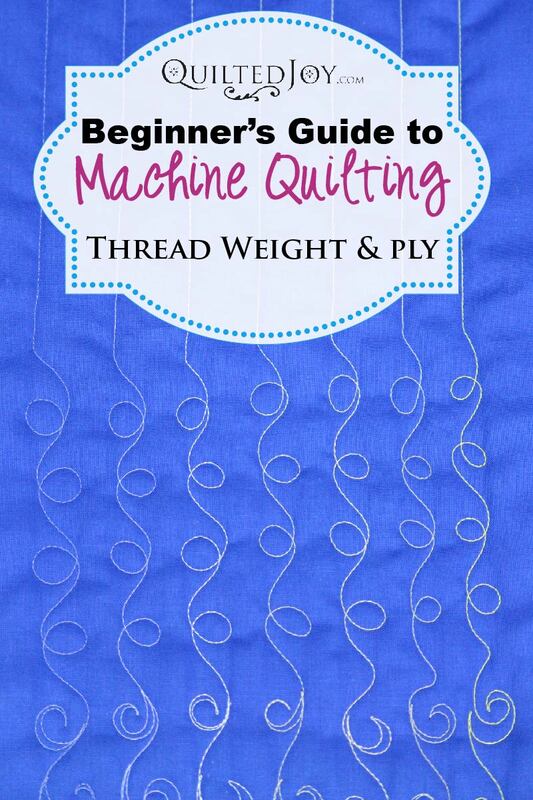 Remember that when referring to weight, the smaller the number, the thicker the thread. The larger the number the skinnier the thread. So, a 35 weight thread is going to talk very loud on your quilt. It is a thick thread and it will be easily seen on a quilt top. However a 60 weight thread, like Bottom Line or Glide 60, will nestle down into the fibers of the quilt top and be much harder to see since it is so skinny. Generally a thread’s weight will be listed first and the thread’s ply will be listed second. Ply refers to the number of strands that are twisted together to make the thread. It stands to reason that your thread will get stronger with more strands or plys of thread twisted together but it can also effect the overall weight too since more plys will increase the diameter of the thread. Some natural fiber threads like cotton, include the staple grade on the label. This refers to the length of the fiber used to create the thread– the longer the fiber used, the stronger the thread. For natural threads, the longer the fiber’s staple, the easier it is to run in a high speed quilting machine like many of the stand up quilting machines on the market today. When running cotton thread in my APQS Millennium, I prefer to use an extra long staple thread as it will put up with the extremely long thread path and extremely high speed sewing I’ll be doing. Think about the thread as a design element. The weight, or thickness, of the thread are just as big of a decision as the selection of motifs and fabric colors when designing your quilt. If you’d like the quilting to melt into the background, select a skinny, lightweight thread – 60 weight or higher. This is a great choice if you are quilting a new motif that you might be a little nervous about. Skinny thread will give you lots of forgiveness so your wobbles and bobbles won’t show as much. If you’d like the quilting to really stand out and speak quite loudly on the quilt, select a thick, heavy thread- 30 weight or lower. Of course, the color also influences how loudly the thread will speak on your quilt top too. There are many different types of threads on the market today. Don’t limit yourself and your projects to just one type of thread. The world is your oyster so play with threads and find your favorites! Previous post: Certified Used APQS Machines Just Released!